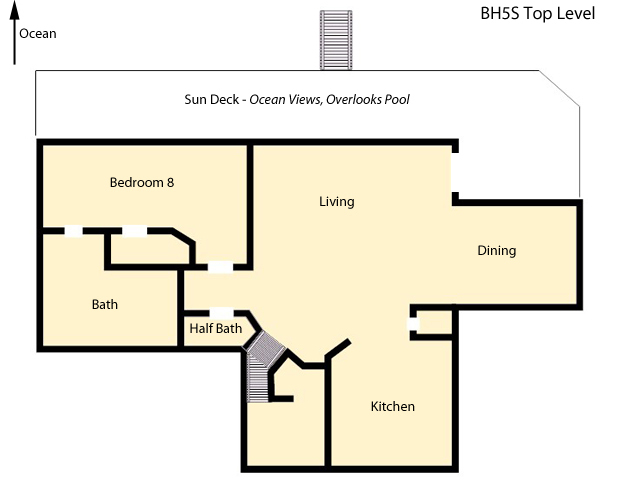 Relax and rest in our grand 8 bedroom Outer Banks vacation home with five oceanfront bedrooms open to breathtaking ocean views and private entrances to decks. Sit back and enjoy the beautiful views of the Nags Head Golf Course and sound, relax in the hot tub or take a dip in your private pool. The beach at 'Easy Street South' is fabulous and very private. Right outside your bedroom and living room is one of the widest beaches on the Outer Banks. 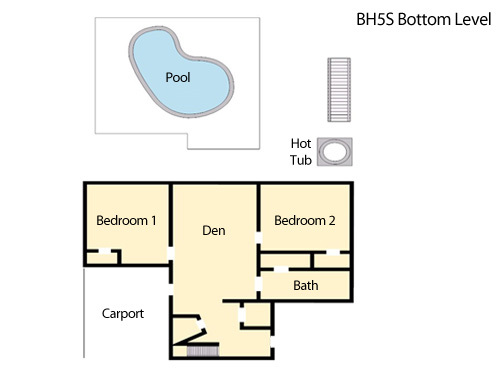 Our home comes equipped with many different treats, such as a jetted tub in the upper level master bath, TVs, DVD players, outdoor ping pong table and a gas fireplace. For families with small children, we also have a Pack n' Play and a high chair. We offer a grill, 2 refrigerators, 2 dens, 2 outside showers to keep the crowd on time for dinner. With table seating for 18 (2 large kitchen tables) plus 5 kids at the kitchen counter, family and friends will enjoy meals together. A long driveway accommodating 7 cars and boats makes life easy when families are going and coming from all their OBX adventures. We loved Easy Street South!! 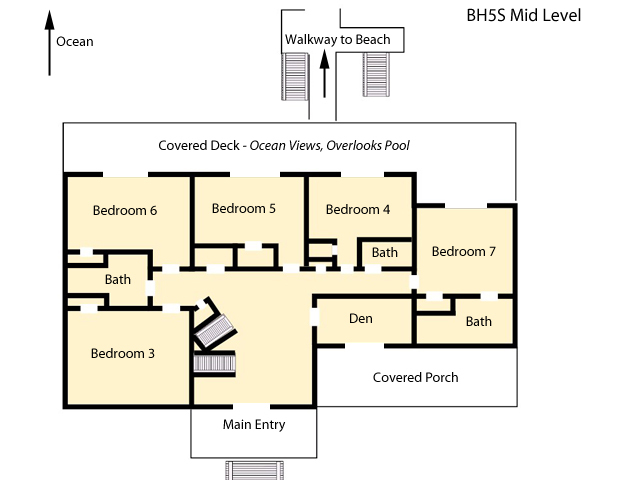 The house was well maintained, clean, comfortable and very spacious providing lots of room to spread out or be together. The multiple outside showers/foot washes on boarded walkway, by the pool, and hose by showers were so wonderful to keep down the sand in the home. And many of our group took advantage of the two outside showers which were spacious and clean. The elevated walkway to dune deck and the beach was great and we loved, loved, loved the added walkway from dune steps to the beach. Such a thoughtful addition which made getting to and from the beach much easier especially for us "older" guests that find climbing through the sand a little more challenging. The upper deck chairs were very comfortable and plentiful. Tinted windows in upstairs master was a nice bonus. Easy Street South is one of our most favorite OBX beach houses and we have been coming to OBX for 28 years and can really appreciate all the added touches that made this home special. Thank you. This was our third year in this house. Great location and house has great space. Always clean when we arrive. For a house at this price and quality, we would love to see some updates. Price has risen 300 to 400 a year with little change to property. Kitchen desperately needs a disposal and newer, larger refrigerator for a house this size. Outside showers very hard to regulate. Furniture upstairs functional but dated. Bean bags in basement need to be cleaned or replaced. Bedroom configuration fits our family for one more year. Would love to stay but price increases too steep for us. Thank you Suzanne for your helpful feedback. We are so glad to hear you enjoyed your home and location, and are sure the owner will appreciate and take into consideration your suggestions as well. We truly appreciate you and your family staying with us while visiting the Outer Banks, and look forward to seeing you again next year! The customer service/sales staff were gracious and helpful. One minor repair was handled quickly. This was a multi-family, multi-generation vacation ages ranging from 16 months to 86 years old. We ALL enjoyed our stay tremendously! The spacious dining room provided plenty of space at the table for big dinners. The bedrooms were attractive and comfortable. Best of all, the beach access was incredible. We had an amazing time during our stay! The house was very nice and also very clean upon our arrival. We have visited the Outer Banks many times, but this was our first stay in Nags Head. Looking forward to our next trip already!